BTC Casino is a specialist bitcoin casino offering a wide range of exciting games, including the latest video slots from NetEnt, Novomatic , Endorphina and Igrosoft, along with roulette and dice games. The site accepts deposits via cryptocurrency Bitcoin for instant payments and withdrawals. Newcomers can claim bonuses on their first and second deposits, while regulars can enjoy reload bonuses, comp points, daily and weekly slot tournaments and lucrative lottery draws! Fast-becoming a favourite bitcoin casino site, BTC-Casino.io offers players a range of top slot games from multiple providers and the ability to play using leading cryptocurrency, bitcoin. This site was established in 2015 and has developed its catalogue to include games by NetEnt, Novomatic, Endorphina and Igrosoft, so players will be able to find most of their favourite slots here, along with some lesser known titles and a small selection of table games. There is also a lottery section and a tournaments page. One great part of the site is the option to have a practice play on all the games first with no deposit needed. Having a practice play is actively encouraged by the site with the option suggested in the ’about’ section and offered as an option when you hover your mouse over the games. It is also possible to play without even registering an account at the site. For those who are new to bitcoin casinos, the banking options are explained in full with a useful guide. The software at BTC Casino is all instant play so there is no need to wait for downloads, while everything is also mobile friendly so you can play all the games on the move. The site is multilingual with English, Russian, Spanish and Italian languages supported with 24/7 customer service support by live chat and email. Security is excellent with all pages encrypted by SSL technology and secured with COMODO, while the NetEnt suite of games is audited by TST. The only really negative comment we could make about the site apart from the small number of table games is the lack of information regarding licensing. Depsite the sophisticated appearance, this lack of clear licensing information could make some players feel unsure about playing here. 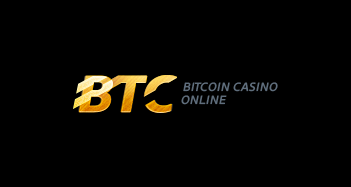 The design of BTC Casino is modern in appearance with the top menu offering links to all the main area of the side, including the registration page, news section, tournaments, lottery, rating, FAQ and rules page. Lower down the home page you will find images of popular games along with a games menu which lets you choose to filter games by software developer and games type. The background to the site is dark and sophisticated looking with a gold logo and clear blue menus. New players at BTC Casino can enjoy a welcome bonus of 150% when they make their first deposit up to 1000 mBTC. Although the bonus is actually listed as only being 100% in the FAQ, on the registration pop up page it states this as 150%). Although the information is hard to find on the site as it is hidden in the FAQ section and not advertised high up on the homepage. This 100% bonus is available when you make your initial deposit at the site. Not only this, you can also get a bonus every single time you deposit at the site with 50% extra available on your second deposit, then a 25% bonus available on top of every deposit after that. In order to actually claim the bonus and have it added to your account you need to contact the support team and tell them about your payment transfer. The negative part about having to contact support to claim your free cash is that some players who have not researched the FAQ might make a deposit and not realise they can claim a bonus. On registration there are also three other bonuses to choose between when you register your new account. You can pick from, 20 complimentary comp points to get your started, 2x multipliers on your winnings for 72 hours or 4x multipliers for 24 hours. Other promotions include the daily and weekly tournaments, which give you the chance to play top slots against other gamblers. There are comp points available for the winners of these slots tourneys with 250 CP available for top spinners. The comp points can be exchanged at a later date for bitcoin. Weekly slots tournaments can be even more lucrative with an ever-increasing jackpot mounting up as the week wears on. Another promotional offer at BTC Casino is the lottery gambling option, which lets you buy a ticket for a nominal fee and wait for prizes of up to 2500 comp points. BTC Casino runs various promotions throughout the year and you can check on the latest offers by looking in the FAQ section of the site. BTC Casino has been known to offer free spins promotions in the past, so it is worth keeping an eye out for new offers regularly. Compete in the daily and weekly slot tournaments to climb the leaderboard and win Comp Point prizes. 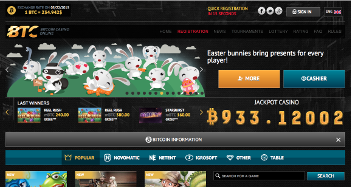 BTC Casino offers punters a range of games from NetEnt, Betsoft, Endorphina and Igrosoft. You can easily access these games from the central menu on the home page. Simply click on the colourful icons, click on ‘more games’ to display more options, search by software developer or search by game type with options for table games and dice games. There is no search box so you can’t search by specific game name, which might prove frustrating if you have a particular game in mind. Down the side of the page you can see the top post in the latest game news section, the most popular slot at the site right now, and the latest tournament news. Games at BTC Casino include hundreds of slots, including many top names that players will know from other sites with the same software options. 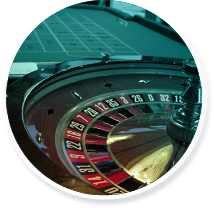 You can also find progressive jackpot slots here, along with a small selection of table games with classic choices such as roulette and dice. Of course, you can also play in the site’s lottery and in the slots tournaments for extra gaming fun. Although the site information section and FAQ section mentions blackjack, video poker and live casino games, these are nowhere to be seen in the games menu. We searched through the entire games catalogue and could not find these options. So the card games and live dealer casino games must be hidden elsewhere or they are not currently available. The games at BTC Casino are available instantly in your browser with no need to download anything to your computer, while the site is fully mobile compatible. The graphics and gameplay are excellent as you would expect from a site that uses top developers, such as NetEnt. BTC Casino is a bitcoin specialist that has chosen to name itself after this popular digital currency. You will find a great amount of information about playing and banking with bitcoin on this site with a grey bar with ‘bitcoin information’ written across it permanently available at the top of the screen. If you click through you will find information about cloud wallets and step by step instructions about transferring bitcoin to and from your BTC Casino account. This section is written in broken English but the general information is clear enough to understand. There is also information about security and how to make purchases using bitcoins using credible BTC exchanges such as bitstamp.net and the possible currencies you can use to purchase them, which include USD, EUR and GBP. The exchange rate listed at the site is 1 BTC = $4911.61. It is not possible to play at BTC Casino using non-bitcoin currency. The sign up process is simple enough with the registration button visible at the top of the website. You need to enter your email address and choose a password then verify your account. Once you have your account you can quickly login using your username and password or sign in with your social media account. To make a deposit, simply click on ‘cashier’ and follow the instructions. You can copy the bitcoin wallet address and choose the amount you wish to deposit. You can also use your mobile to deposit via the QR-scanner. There is no minimum deposit amount. To withdraw your cash, click on the withdrawal tab within the cashier and chose your amount. You can make instant payments and withdrawals using bitcoin. It is also possible to play the games without registering by simply clicking on ‘practice’. The software is available as instant play software so there is no need to download anything to your computer. You can also check on how you are doing by looking at the ‘rating’ page to see your player rating by money and by comp points and compare yourself with other BTC Casino gamblers! This is a good way of adding a community aspect to the site. All the NetEnt games at BTC Casino are provably fair as they are tested and audited by TST, a known independent testing authority within the online gambling industry. You can read about this in the ‘fair gaming’ section on the site. Although the TST tests are famous audits on NetEnt games, the tests for lesser known providers such as Igrosoft are not always audited. There is a ‘provably fair’ badge at the bottom of the site which should give gamers peace of mind. BTC Casino gives you the chance to play all of its casino games using handy instant play software without any need for downloads. Thanks to the optimised software you can also easily play on your Apple or Android mobile phone or tablet for the best gaming fun on the move. The site is HTML-5 powered so you can simply head to the casino on your smartphone or tablet and start playing right away. The software is smooth with clear graphics and perfectly optimsied for the smaller screen. This mean that playing on mobile at BTC Casino gives the same great experience as playing on desktop. 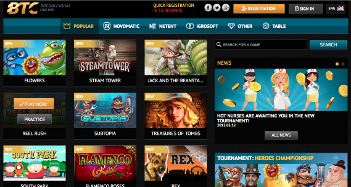 BTC Casino is a modern site which is strongly focused on slot games. Although the site mentions card games and live dealer games, these are nowhere to be found in the games section so they appear to not be currently available. This trusted bitcoin casino gives players the chance to play slots from NetEnt, Endorphina, Igrosoft and Novomatic while the two roulette games and the one dice game will have to be enough to satisfy table games fans. The severe lack of table games will be disappointing to some players, however slots enthusiasts should have more than enough to enjoy here. The site goes to great lengths to explain bitcoin banking in its information pages, so even newbies to this cryptocurrency can feel confident depositing and playing at the site. The customer service options include live chat and email support but no telephone number is given. The main negatives are the lack of table games and poker options, some conflicting information across the site regarding games choice and bonuses, and the lack of licensing information. We liked the player ‘rating’ section which lets you compare your performance with other players in both real cash winnings and comp points. The promotions are also good with bonuses, comp points, tourneys and lottery options available, along with regular reload bonuses. Overall, despite a few issues with conflicting information, BTC Casino is one of our recommended Bitcoin casinos for slots players with great software and promotions and a modern, responsive design.